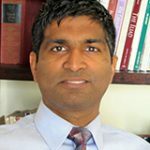 Vinod Srinivasan earned his Ph.D. in mechanical engineering from the University of Minnesota. Research in the Lab investigates fundamental transport phenomena that are often critical to energy production, storage and conservation. Major areas of research include phase change heat transfer relevant to Rankine cycle based thermal power plants, electro-hydrodynamic heat transfer for enhancing condensation and evaporation phenomena in heat exchangers, heat transfer in solar-thermal power plants, such as instabilities in thermal storage media, and radiative heat transfer in solar receiver systems. In addition, there is a significant effort towards examining the utility of linear stability theory in predicting the onset of experimentally observed global modes in several classes of flows, such as variable property jets and wakes, and spray atomization of high-viscosity liquid jets.